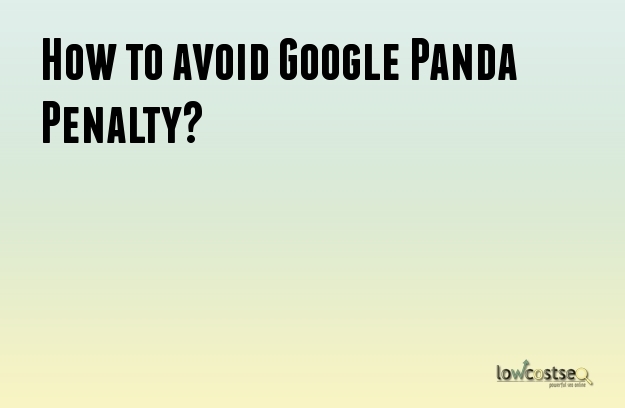 How can I safeguard myself from Google Panda? Google Panda is an alteration to Google’s search algorithm introduced in early 2011 and has since changed the dynamics of how search results appear to web surfers. It is considered to be one of the most radical changes that Google has ever implemented and is still significant today. This is a black hat SEO technique that was commonly used to ensure high ranking for a certain keyword. Over optimized websites were affected minimally when Google Panda was first introduced. However, the update that was released in March 2013 rendered this technique useless. Linking to a website or page that had a high PageRank would often transfer that PageRank to the sites linked to it. Many site owners formed link exchange sites where site owners who had high PageRank websites would place follow links on their sites for a fee. These link farms were among the first targets of the Panda update as the importance of PageRank was downgraded, rendering these link farms largely irrelevant. Ad based sites are created solely to earn by having Ads displayed on them. Such sites would often hide the ads so that the web surfer would click on them unintentionally while others ensure that a surfer will have to click on an ad in order to complete a desired action. The last Google Panda update on July 18, 2013 softened some of the severe penalties imposed previously. In order to minimize circumvention of its algorithms by site owners, minor updates are made every month and implemented over a period of 10 days. The Google Panda Update affected almost every major content website on the Internet, with the majority seeing a huge decline in the traffic they were receiving previously; it is worthy to note that some websites never recovered from the penalty. The Panda update targeted sites that had duplicate content found on other sites. In order to maintain a high search rank, websites are now required to have unique content. Google rewards websites according to the originality of the content. Blogs and websites that are not constantly updated with fresh content would have lower traffic as opposed to those that are consistently updated. A stale website would not be recognized as one that adds value to the readers, which means that it will slide down the search rank. Imagine viewing a website swamped with display and pop-up advertisements? Google Panda’s algorithm was incepted to eliminate this painful experience for readers who are genuinely searching for information. There is a recommended ad format layout that Google Adsense users are familiar with and that layout is in accordance to Google guidelines. The integration of social media into your website enhances its visibility. The more the site is liked, the more Google affirms its value. Google considers traffic and endorsements from social media sites as proof of the quality of the website's content. Any person familiar with SEO should have already heard about Google Panda. The Panda is an algorithm used by the Google search engine to check for websites that have a poor content. Google Panda can affect the rank of websites by determining the quality of the content the websites contain. Websites that have a poor content will get penalized by lowered rankings. On the other hand, if your content is of a high quality, your website will be given a boost in the rank. Is Your Site Vulnerable Against Google Panda? Google Panda can lower the rankings of your website if it detects certain characteristics. You need to check if your website has any of the following features. Lack of original content or very little of it. Too much content that has been duplicated from other websites. Pages that have been visited by traffic very few times. Low quality or useless inbound links to the pages or website. High bounce rates for the pages or the website. Too many webpages with little or zero original content. Too many adverts which are irrelevant to the website or content. Too much of boilerplate content. The title tag and the page content have no relation to the searches. Using the same words or phrases in the same content unnaturally. If you notice that your website has been affected by Google Panda, there exist techniques to rectify the problem. You just need to follow a procedure. Locate the pages that have been affected the worst by Google Panda. Determine the differences between the pages that have been affected and the pages that have not. Use the differences to make changes to the affected pages and test them for viability. You should remember that the pages directly may not be the root cause of the problem. Create a list of all the pages in your website and divide them by category in a tabular format such as a spreadsheet. Fill in the table with the factors relevant to each page. These factors can be anything like too many advertisements and little original content amongst others. Determine the number of pages in your website which contain poor quality content. Improve the content for these pages. Create original and unique content for the pages that have duplicated content. If some of those pages are unnecessary, remove them. Ensure that the pages are free from content that has been duplicated from within your website. Some of your pages may be over-optimized in which case you will need to edit them. Ensure that the user experience of your website is good by streamlining the appearance and navigation. Increase user experience by adding multimedia content for visitors to enjoy. The content of your website should be easy for people to read. The content should be thoroughly promoted in the various social networks. In spite of your best efforts, if there is no change in rankings, you should contact Google. However, this step is usually unnecessary and may not have too much of an effect. Ensure that the changes have been implemented quickly so as to eliminate the Google Panda penalty. If you have been hit by Google Panda and need help in turning it around then contact us today.